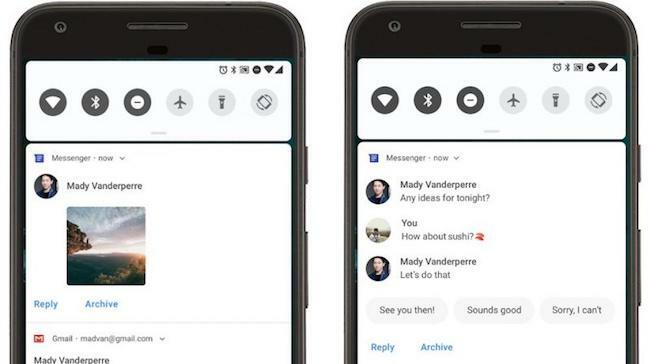 Announcements about the latest release of Android are always the highlight of Google’s annual developer conference I/O and this year was no different. Amongst the many significant and somewhat scary announcements made at Google I/O 2018, Android P was a major highlight. Android O (Oreo) is still only on 4.9% of devices. But Google is already giving us a sneak peek at the next version of Android. At Google I/O, the first public beta was launched for Android P which I’ve installed on my phone and I cannot wait to walk you through everything that’s new in the 10th release of Android. Here’s a list of Android P features that we will be going over in this post. 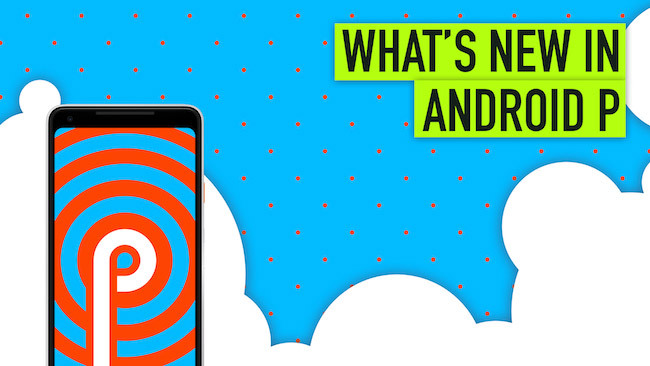 Let’s be honest, when Android was launched, design and pretty-ness wasn’t really a highlight, it stood for openness. And while that fundamental principle behind the product hasn’t changed one bit, what has changed is Google’s stance on the design of Android and all their other products in general. This was asserted in 2014 when Google announced the Material Design system for building beautiful products on the web and on mobile. Fast forward to 2018 and that vision has clearly backfired. Instead of making a brand uniquely identifiable, Material has sort of unified their look and feel, preventing them from standing out in the ecosystem. So to fix that, Google announced a refreshed take on Material design with what they’re calling Material Theming. Material Theming allows brands to express themselves more uniquely than before while still standing on the foundation of the core Material principles. The guidelines now embrace the differences and uniqueness. The very first product that showcases this intention is Google’s version of Android P or what we popularly call Stock Android. Google wants their products to shine in their own light, so they’ve made their OS look and feel more like themselves. You’ll notice this intention everywhere across Android P if you are running it on a Pixel device. Everywhere else the company is giving more freedom to developers and OEMs to put a coat of paint that best represents them. 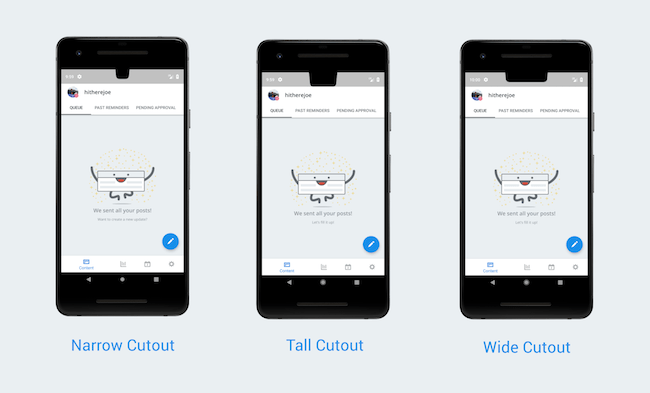 As seen in the screenshots above Google is emphasizing typography and shapes, every component of the system is now more rounded and has Product Sans as the system default primary font. One of the places where things never seem to be getting better is in the battery department. Smartphones are shipping with screens larger than ever and resolutions up to 4K, but they still don’t manage to last even a day at best. To fix this problem on Android, the Android team partnered with Deep Mind (Google’s AI division) to bring some serious innovations in the energy consumption aspect of Android. The very first instance of this partnership is seen with the Adaptive Brightness settings. 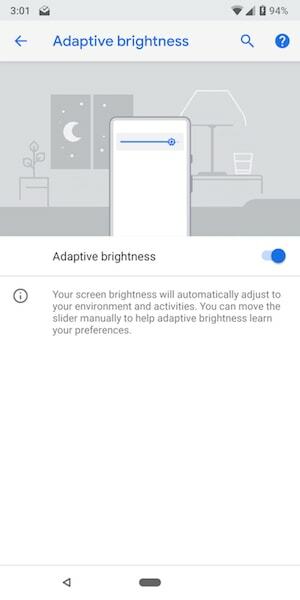 Google has managed to use on device machine learning to the brightness settings so now your screen will learn your preference over time and make sure your screen is always at the most optimal brightness level. Gone are the days of manually fiddling with the brightness. Adaptive Battery is another part of the system which will use AI smarts to make sure you’re not running out of juice before the end of the day. 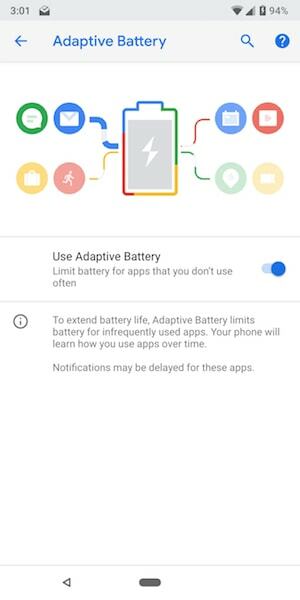 Adaptive Battery uses machine learning to understand the usage patterns of users and then based on the analysis it limits the power to the infrequently used apps. The device will learn about these apps over time, so in the long run, you’ll notice significant improvements in your battery life and also you’ll no longer be running low on battery due to some random application you installed ages ago which still syncs in the background. When the iPhone X was announced last year, it was the public’s first glimpse at where smartphones were heading and what’s on hold for future. It didn’t take more than a few months for every other brand to “get inspired” by the iPhone design and now the market is flooded with devices from the likes of LG and Asus with the similar form factor and design. Safe to say that all-screen and no bezels are our future. But this design also opens up the room for new interaction models. 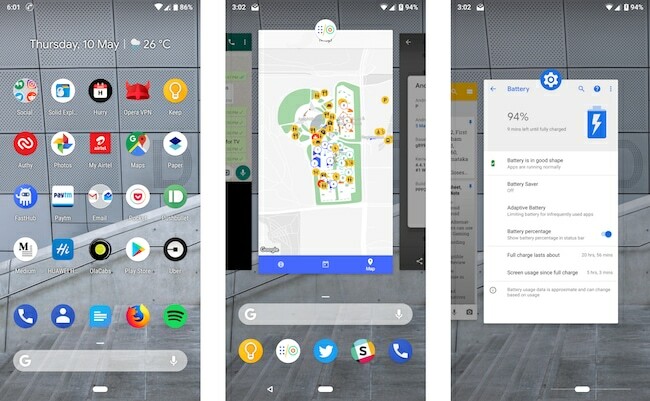 One of the obvious ones is the gesture-based navigation which we also got to see on Android P.
Once you opt-in to use the gesture-based navigation, your navigation bar will turn into a more minimal control with a home button. Swiping up on the home button will take you to the recent apps screen. If you swipe up again, you’ll be taken to your all apps section. If you want to quickly switch between apps you just have to swipe right on the home button and then swipe in the direction of the app you want to open. On text, it sounds complicated and for a good reason, it is. It’s still too early to say if this is the right way to do navigation, but we’ll probably have a clearer picture of things once the stable release is out. Let’s get a fact clear before moving forward. The iPhone X was NOT the first phone to come up with the notch. We saw a similar approach taken by the Essential Phone. And while Essential handled the status bar in their own way, Google wants to help manufacturers do the notch right. After all, it’s the style trend amongst phones in 2018. Android P naively supports display cutouts aka notches. The system will arrange the status bar contents with respect to the display cutout. If you are on Android P, you can simulate a display cutout by going to the developer options and tapping on the Simulate Display Cutout option. This option will let developers better style their apps for the phones that come out with notches. With every new release of Android, one of the things that get consistently modified is the launcher. And while it’s not a compulsion for OEMs to use the launcher that Google ships it’s interesting to see the smarts they build into it. In Android P the launcher plays a considerable role in bringing forth the idea of making the OS smarter. When you swipe up from the home button, you’ll get a list of suggested applications and ongoing into the all apps section you’ll see suggested actions that you can take on certain apps. As an example, if your earphones are connected you will be prompted to play your music if you use Spotify. Ever since Android Lollipop was released, Google has made a mess of the Android volume controls. 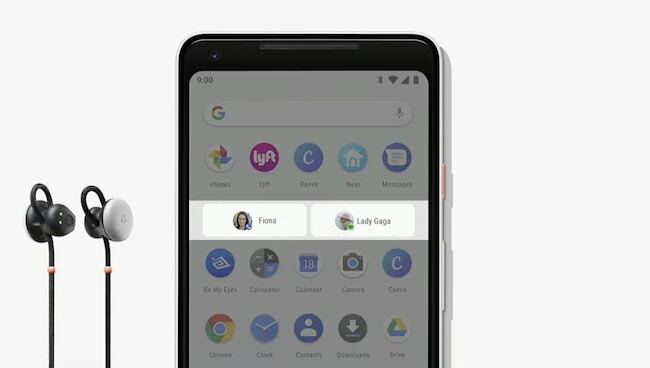 They’ve heard us and they’re finally fixing it for once and for all on Android P. With this release of Android when you press the volume button, you’ll be greeted by a new vertical slider which shows up on the right side of the screen instead of on the top. By default, it will now control the media volume. And if you want to toggle the ringer, you have a dedicated title just for that. 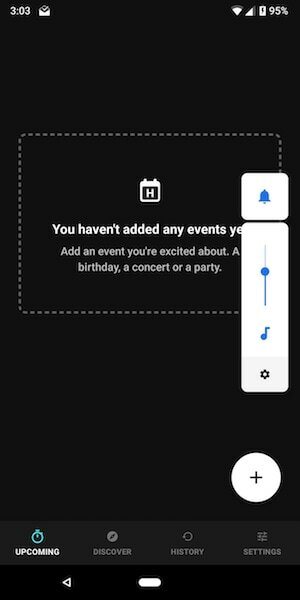 To manage the alerts and ringer volume you can tap on the gear icon on the bottom and it will take you to the sound settings where you can adjust the alarm and ringer volumes. This finally eliminates a headache that Android has been giving us since the Lollipop days. Android’s notifications are probably the best you can get on any platform. And with every release of Android, they’ve made the notifications even more delightful and feature rich. 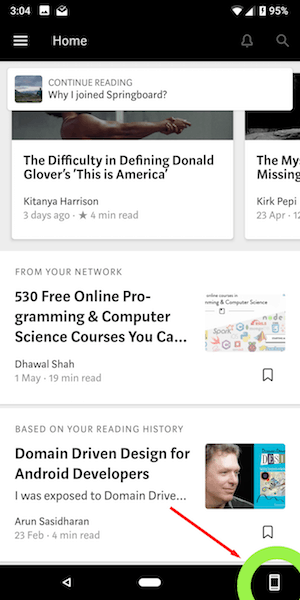 On Android P, for example, you can now get a preview of your conversations on the notifications itself and this includes media previews as well. Another exciting addition is the Manage notification option. Right in the notifications shade. Tapping on that will quickly take you to the list of apps where you can turn off their notifications. The system is also bringing its smarts here and if it notices you constantly swiping away notifications from an app, it will actually ask you if you permanently want to turn off the notifications for that app. 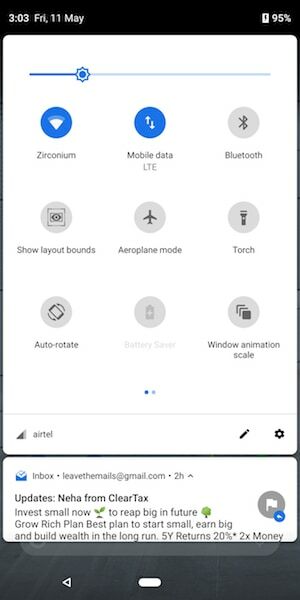 This is probably one of the only section that has seen a significant visual overhaul in Android P. The quick settings options are now rounder and sadly, tapping on the Wi-Fi or Bluetooth tiles don’t show a list of devices/networks to connect to like it used to on Android O and below. But this is just a beta preview so that may very well change. You’ll also notice your cellular status moves to the bottom of the card on swiping down on the quick settings section. This is one of the issues I can personally relate to at all levels with all platforms. I hate auto rotate I don’t want the phone to go in landscape when I tilt the screen it should let me do that myself. But that process should be seamless. Thankfully this is fixed in Android P. Now when you tilt your screen, instead of rotating the screen, you’ll get a small prompt on the lower right corner and if you tap that, only then will your screen rotate. All of this is done without you having to turn on auto rotate. World peace has finally been restored. 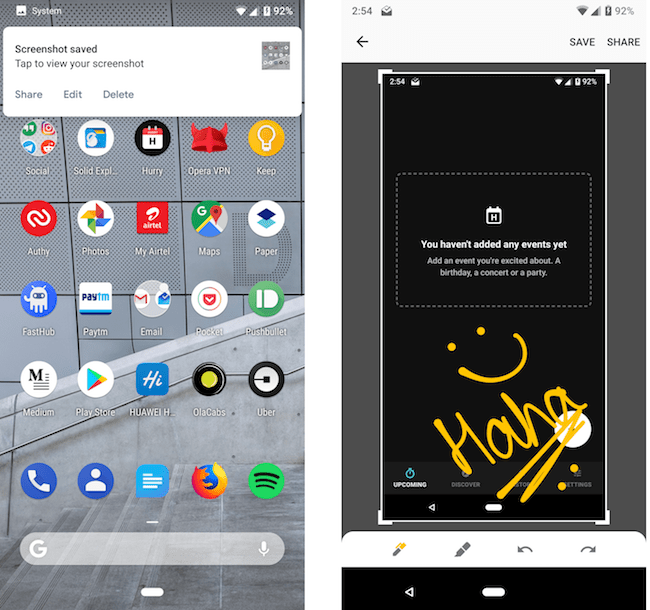 All the folks who are fans of taking screenshots can rejoice as Google is finally bringing screenshot annotation feature natively to Android. All you have to do is take a screenshot using the volume down and power button and you’ll get a notification with the option of editing the screenshot. Once you tap Edit, it will take you to a screen where you can mark up your screenshots or highlight something important in it. Agreed there are apps to do the same but it’s nice to have it built into the system itself. The Settings app has also received a fresh coat of paint and now looks more colorful than ever. Every setting option is now highlighted with a different color blob and related settings are nicely tucked away. This is in stark contrast to the monotone UI we saw in Android 8.0 and below. A search bar is right on top to help you quickly search through the settings. But apart from that, there’s nothing new in here. Lastly, Google has put a spotlight on the idea of digital well being and has emphasized that one should focus on the Joy of Missing out. To promote this agenda, it’s trying to make it obvious that you’re using your device too much and it’s time to connect with your loved ones. This is highlighted in Android in a number of ways. 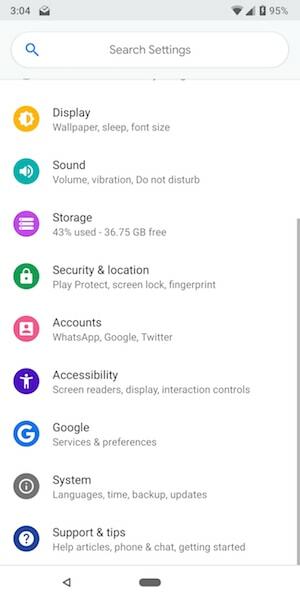 First, Android P will ship with a dashboard which will give users fine-grained details about all the apps that you have used in a day, how long have you used them for, how many notifications they’ve sent you and how many times you have unlocked your device. This will allow and help users to better manage their digital lives. Android P will also support and App Timer which will allow users to set the duration for which you want to use the app. If you exceed that, the system will prompt you and tell you that it’s time to set aside your phone. Android P also has a new Shush Mode which will turn on do not disturb when you place your face screen down. This will make sure you’re spending time and are at the moment instead of being distracted. And lastly, Google is also focusing on the fact that a good nights sleep is essential to maintain a healthy lifestyle. This is why they’re introducing a feature called Wind Down. When you ask Google Assistant to Wind Down it will trigger a bedtime routine and set your screen to black and white which will help your brain relax and thus helping you fall asleep. Android P is definitely Google’s most ambitious and feature-rich release since Lollipop. It not only includes new features, it also has helpful additions to the system that helps you live a better life. It will be interesting to see the updates Google adds to the upcoming beta releases and you can be sure we’ll cover them for you.